Yujin Oh graduated from NYSID’s MPS in Sustainable Interior Environments program in 2014 and was a recipient of Alumni Award. She received her BFA in Interior Architecture at Rhode Island School of Design. She is currently a designer at the The Switzer Group. You won the Alumni Award for your involvement in the US Green Building Council. What is the mission of this group and what do you hope to accomplish? I am the vice president of the US Green Building Council (USGBC) student chapter. The council’s mission is to transform the way we design, build, maintain and operate our buildings, homes and communities. They are committed to a prosperous and sustainable future through cost-efficient and energy-saving green buildings and they support college and university students in integrating sustainability themes into their curriculum. Students advocate for sustainable university practices and policies and participate in hands-on green building experiences on their own campuses. As NYSID’s student chapter, we organize activities such as visits to sustainable architecture, interior design firms, and sustainable material showrooms and factories. We also participate in community service and host lectures. We are currently working on building the beginning of a green roof system on NYSID’s roof top which we installed early July. Our green roof project even has a Facebook page. My objective in the group is to encourage the students at NYSID to be more aware of sustainability and I would like future USGBC students to learn the importance of green design. I have always felt that designers shouldn't only prioritize aesthetics, but also be thoughtful about how it affects the client and the environment. Sustainable design impacts people's health and productivity, and therefore I believe those who consider green design can be more thoughtful in their work. For your capstone project, you worked with two other students to design a house that incorporates biomimicry. What is biomimicry and why was it a part of your design concept?Biomimicry is the imitation of the models, systems, and elements of nature for the purpose of solving complex human problems. 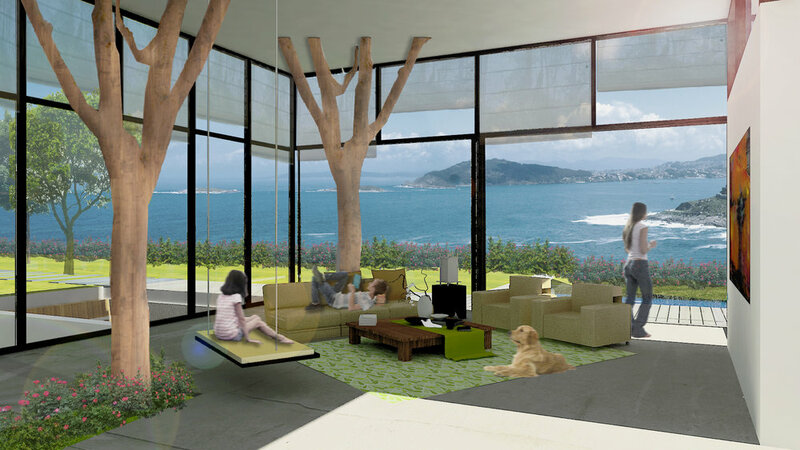 The biophilia theory suggests that there is an instinctive biological bond between human beings and other living systems and biophilic design is concerned with the enhancement of this connection for human health and well-being. What were some of your inspirations for the design solutions, such as the green roof and grass extending into the inside of the house? We wanted to blur the lines between the interior vs. the exterior and create different levels and this scattered feeling. It was also important to us that we create a core circulation area where it tied all the segmented spaces together. 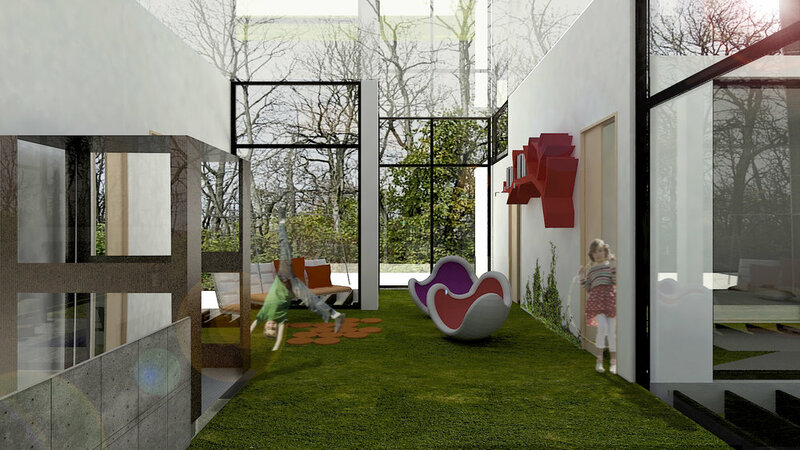 Several "in-between spaces" introduce nature and invite new ways of living. For example we shifted the kitchen area away from the dining room, and brought a garden inside where the family can grow and pick vegetables and also give a feeling of dining outside. 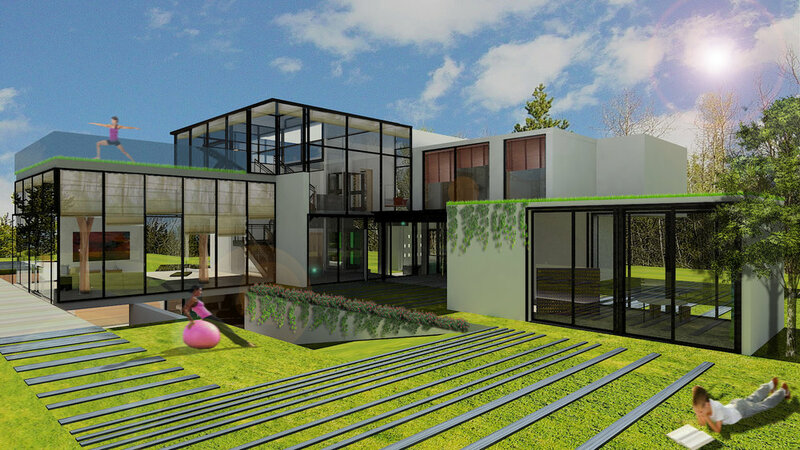 The green roof at one level functions as storm water collector that reduces heat in the interior of the space, and the higher level is made of photo voltaic glass allowing the family to collect solar energy to be used throughout the house. We wanted to create an open home plan for the Miller family with plenty of space to explore, creating interactions with nature, and to provide access to natural light because the couple both work in nature for their careers, one is an herbalist, and the other is in oceanology. The other reason is that one of their three children suffers from Down’s Syndrome and the opportunities to explore nature in a safe environment would offer variable tactile experiences which could be educational.